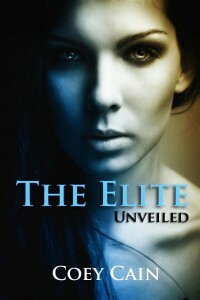 Book One of The Elite Saga is available now! When Warren is arrested, Joelie has the ability to escape the emotional jail he’s held her captive in for two years. Her father’s house should be her refuge, but it’s another kind of prison altogether. All Joelie wants is a normal, peaceful life. Discovering that she is one of The World Elite, a genetically superior race, puts a whole new set of shackles on her life. Her destiny is planned, and her future marriage is pre-arranged. While Joelie still remembers her childhood crush on the Elite, Sender Stelle, it isn’t easy to accept a betrothal to a man she barely knows beyond his photograph. Warren doesn’t want to release his control over her. The World Elite would force her to fulfill her destined duty, and Sender has gone from resigned acceptance to benign co-operation with the powers that be. Like Coey Cain on Amazon and don’t forget to “Like” on Facebook. Stay tuned for updates for The Elite II. One of the best books I’ve read this year! Can’t wait until book2 comes out.